Rovinj was our first stop in Croatia after two weeks in Italy. It felt like forever getting there. Altogether, an almost 5-hour journey from our hotel in Venice, combining vaporetto, trains and bus, and two border crossings into Slovenia and Croatia. Needless to say, we were anxious to arrive. 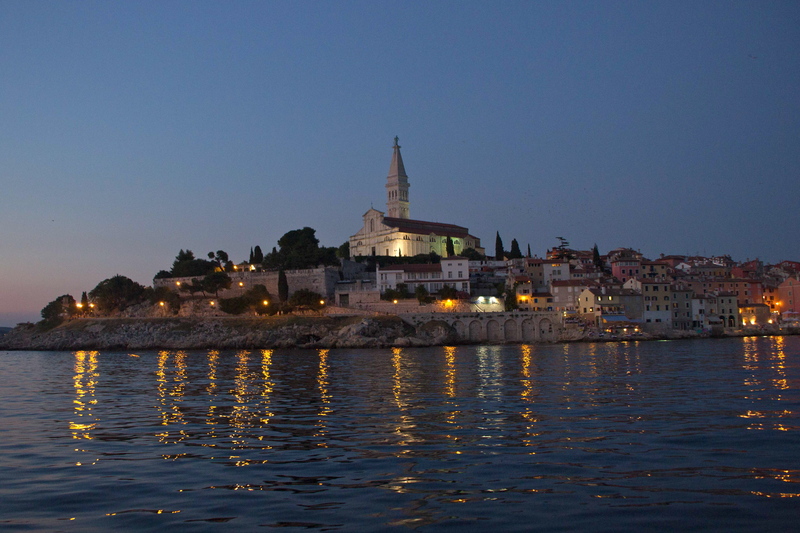 Rovinj is on the coast in the Istrian region of Croatia, facing the Adriatic Sea. It has a rich history, occupied by first the Romans, then Venetians, Austrians, Italians. With the rest of Croatia, it became part of Yugoslavia before Croatia gained its independence. The old town has many narrow cobblestone streets, which lead to its most famous site, the Basilica of St. Euphemia. Many fishing and sightseeing boats dot the harbor. If you love seafood, this is where to splurge. Simple, yet fresh and delicious dishes. On our third evening, we joined a sunset sailboat ride and enjoyed the view from the sea. We were tickled by the breeze, which cooled us from the day’s high temperatures and humidity. The reflection of lights on the water from the road, restaurants and bars was a stunning sight. The church had a soothing and serene glow. Restaurants at the waterfront had special tables teetering on the rocks. Very romantic, yet one wrong move and you and your spaghetti vongole would make an unplanned dip into the Adriatic. My husband and I had a drink at Valentino Bar, where we drank our mojitos on colorful cushions, inches from the sea. Shakespeare’s tragic love story, Romeo and Juliet, will forever immortalize the words, “in fair Verona”. The town where these two lovers met is not just for the romantic, but also for the history and opera aficionado. 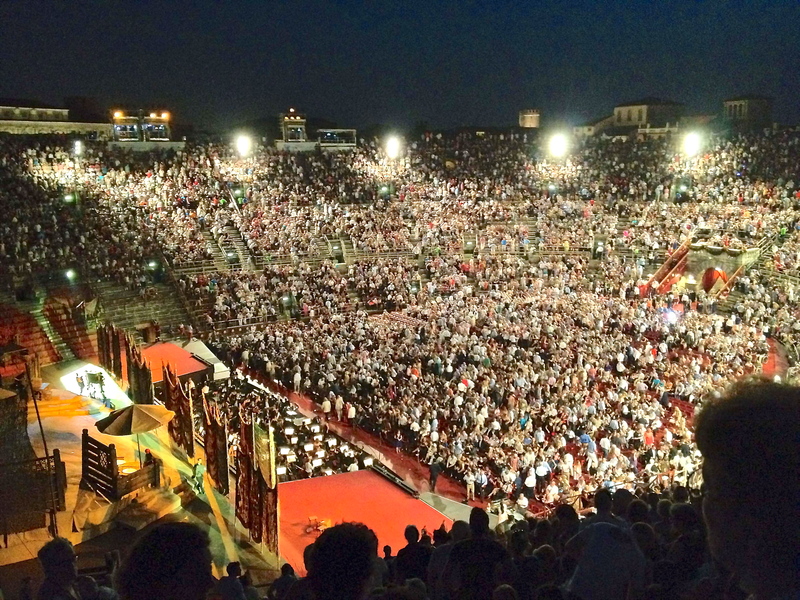 I am not an expert in either subject, but was determined that my family would take part in this town’s summer tradition — an evening of opera in a 2,000-year old Roman amphitheater. I really didn’t care which opera we were seeing, but was relieved that it was Carmen, since I would at least recognize some of the music. The scene was breathtaking. Close your eyes and imagine. Sitting where Roman spectators gathered as early as AD 30; as the sun dips behind the theater, lighting each other’s tiny candle (thousands) to welcome the opening act; gazing at the twinkly stars; listening to beautiful voices magnified naturally by the theater’s outstanding acoustics; and oohing at the colorful pageantry of costumes and stage sets. I still get goosebumps whenever I remember this enchanted evening. My family was in Venice for just 2 nights, so I squeezed in one island to visit just to get away from the crowds. 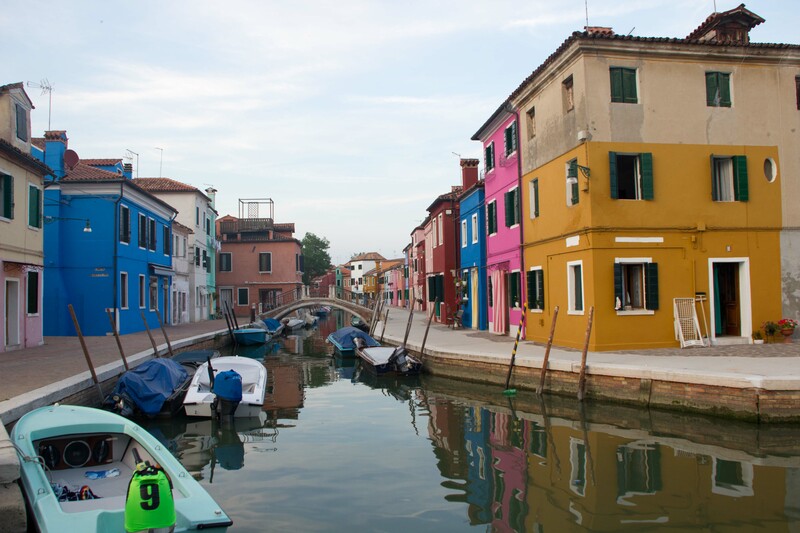 I decided on Burano because I wanted to see the multi-colored houses I had seen in so many travel magazines. And, I knew that the farther away it was from Venice, the fewer the tourists. We took a 45-minute vaporetto ride from Fondamenta Nove station in Venice and arrived at about 6:30 in the evening. What a treat! Burano definitely has character and charm. By the time we got there, tourists had come and gone earlier in the day, so it was very quiet. 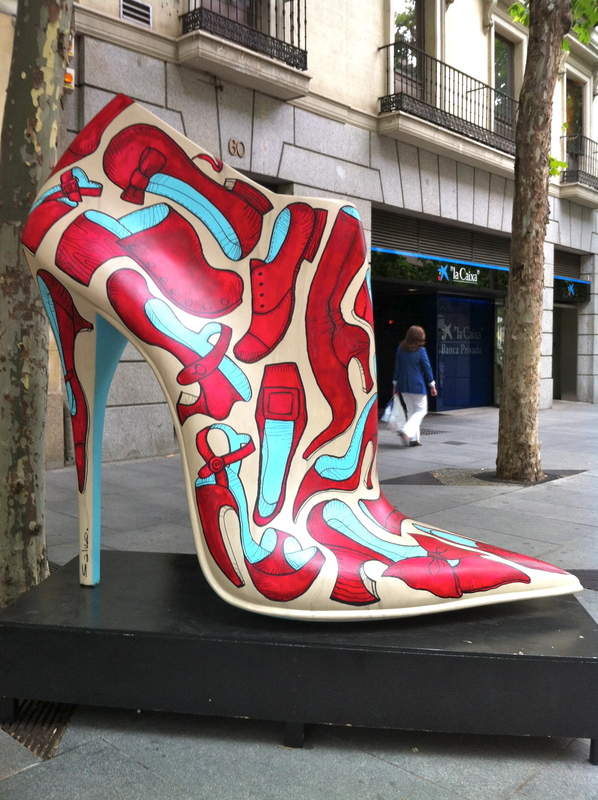 We walked up and down the streets, which were lined with brightly painted houses. The people are certainly not timid about their colors. Each house color contrasting perfectly to the next. Every street was like this. Certainly a feast for the eyes. No cars, but motor boats lining the canals. We caught glimpses of the lagoon from so many different spots. Senior residents pulled chairs out of their houses to sit outdoors and enjoy the refreshing breeze and evening conversation. The quaint piazza centrale has a small church and no more than a dozen restaurants and stores. The vaporetto ride back to Venice at night could have been romantic, if my husband and I were not traveling with our three kids. Nonetheless, it was wonderful seeing the lagoon lit up by lamps, and the glow of Venice. At the end of our one-month summer vacation through Europe, we had had enough of the heat and crowds of touristy cities. We longed for open space and fresh air. After an overnight stay at a nearby pension, my family and I finally arrived early morning at this long-awaited, breathtaking wonder of nature. The photos on the travel websites were real! The lakes are a stunning palette of emerald, turquoise and azure blue. Crystal clear waters show off the abundance of trout. The waterfalls, of varying heights, surprise you around the bend, and flow nonstop as if the turn-off valve had broken. Close your eyes and hear the gurgling. Butterflies with velvet blue wings flutter by. Ducks float quietly over the trout. Limestone provides a nice contrast in color and texture to moss and algae. We easily explored the connection of lakes by shuttle bus, ferry and boardwalks. These walkways allowed us to traverse the lakes, while in other areas, protect plants from foot traffic. 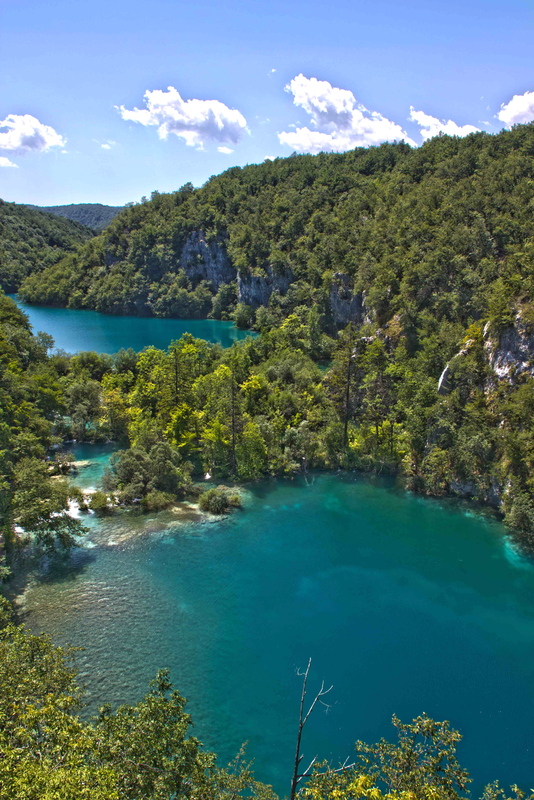 Plitvice Lakes National Park, the largest in Croatia, has been a UNESCO World Heritage site since 1979. Though it has attracted many tourists over the years, it is excellently maintained — no trash lying around, swimming and fishing are forbidden, no cars allowed inside. We have been back in California for a few weeks now. Of the 8,000 photos we took on our trip, only one has been framed and sits in a prominent spot in our living room. With a glimpse of the blue-green water, I smile at the memory. While still in California and planning for the Cinque Terre (five villages) hike, I must say there was an overwhelming amount of online reviews and advice on how to tackle this popular hike. From everything I’d read and photos I’d seen, I deduced it was a beautiful hike along the coast, but you had to be prepared and forewarned. Total hike time ranged from 5 hours to 8 hours, depending on physical ability and how much time you spent touring the villages. 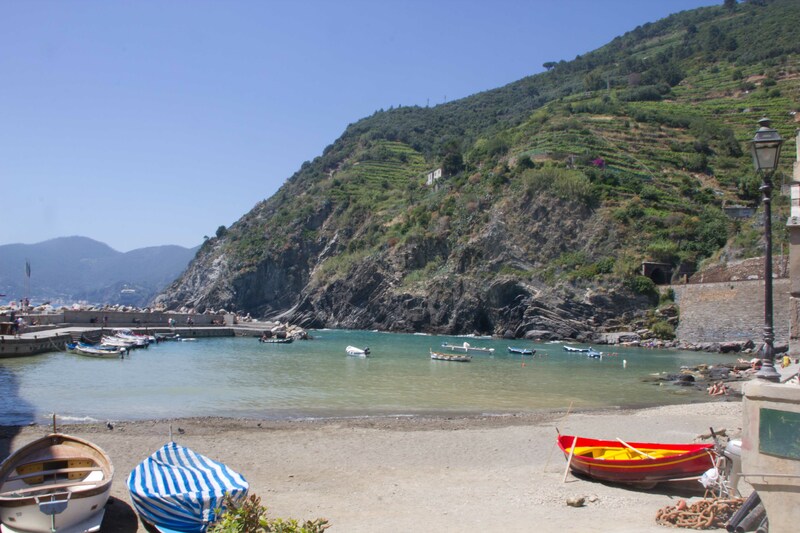 Everyone agreed to start from the southernmost town of Riomaggiore and work northwards to end up in Monterosso. If you got tired, one reviewer suggested taking the train or ferry to the next town. I decided to get one more person’s advice — the hotel (Hotel Villa Anita) owner, Sandro. Since he had given us such great advice and directions for the hike to San Fruttuoso, I knew we could rely on him again. After a hearty breakfast, we filled up our water bottles (a must!) and set out for our excursion. 1. 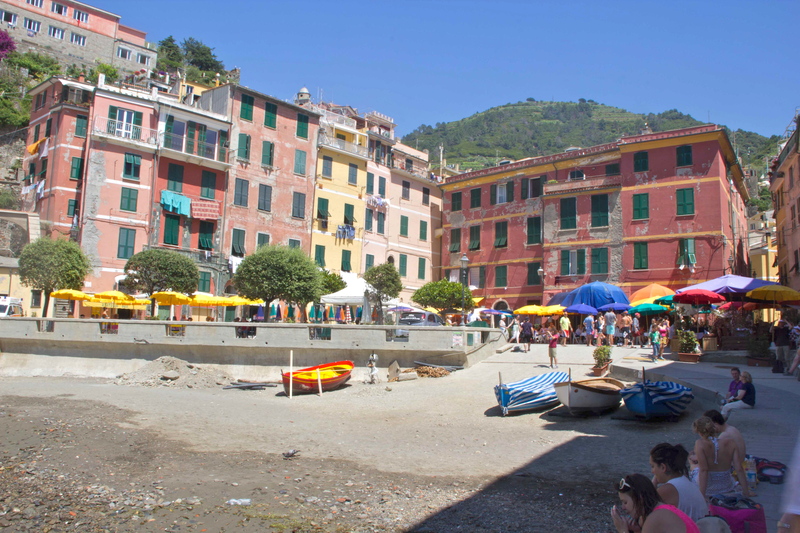 1-hour train ride south from Santa Margherita Ligure to Riommagiore, walk around the town for a few minutes, start the hike at the coast and walk the “Lover’s Path”. Yes, we can now understand why it’s called this. The view is beautiful and romantic. We were charmed by something else. 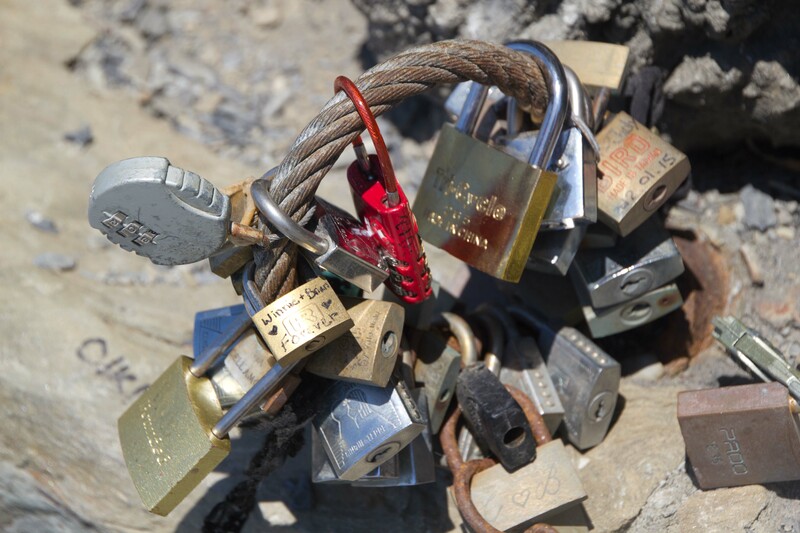 To express a couple’s love for each other, the path over the years has been decorated with locks. Attached to rails and fences, these locks come in a splendid array of various sizes and metal finishes, etched with initials and hearts. 2. After a 30-minute walk through Lover’s Path, arrive in Manarola and visit the town for a few minutes.The seaside is quite stunning. 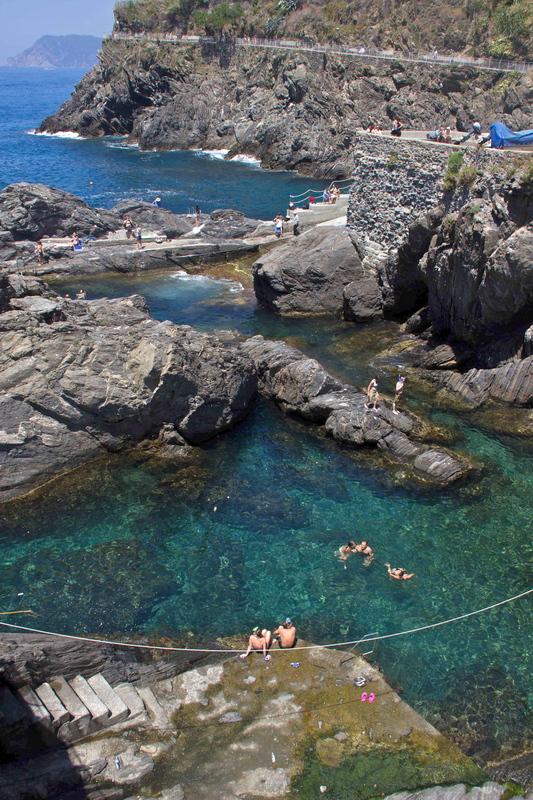 Gigantic rocks used as diving platforms for the young and daring. Small, colorful boats anchored waiting for their passengers. Waves splashing onto shore. 3. 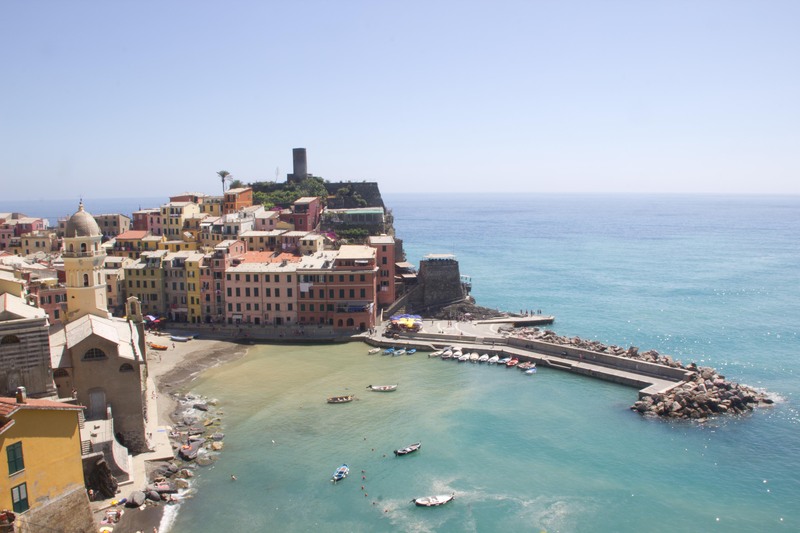 Take a short train ride to Vernazza, skipping Corniglia because the trail was still closed from the mudslides in 2011. (Or, you could take the ferry.) While walking around the town, affects of the mudslide were visible, though much of the town was in great shape. We saw some building basements full of dirt and debris, with workers repairing broken walls. The water at the beach was a murky green from excess mud. We decided to take a gelato break, and I snacked on calamari wrapped in a small newspaper cone. Reminds me of chips doused with salt and vinegar wrapped the English way. 4. 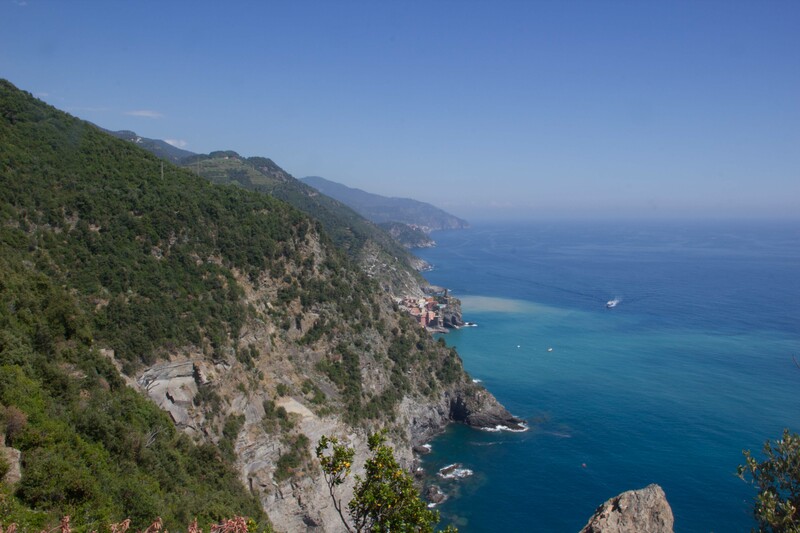 Continue the hike on the coast to Monterosso. Have a snack and cold drink, enjoy a swim. 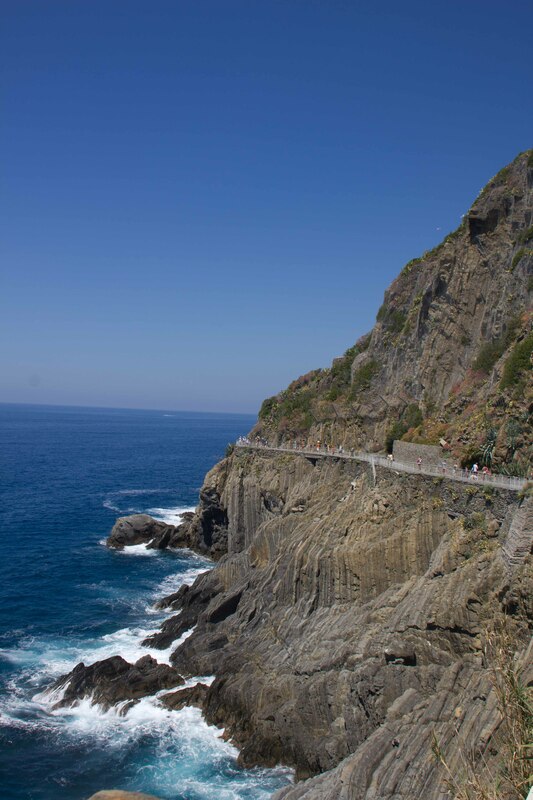 The hike from Vernazza to Monterosso was spectacular, but arduous. Steep inclines, dramatic descents, shady in areas, and full-sun in others. Always a welcoming view of the sea. The hills are terraced with vineyards, though no grapes at this time of year. Once in awhile we would see a grape-picking contraption — since I don’t know the name, that’s the best way I can describe it. It is a small buggy, gripping a very narrow metal track, with a seat for the driver, and a metal container to fill up with grapes. The track winds itself around and up the steep incline of the mountain. 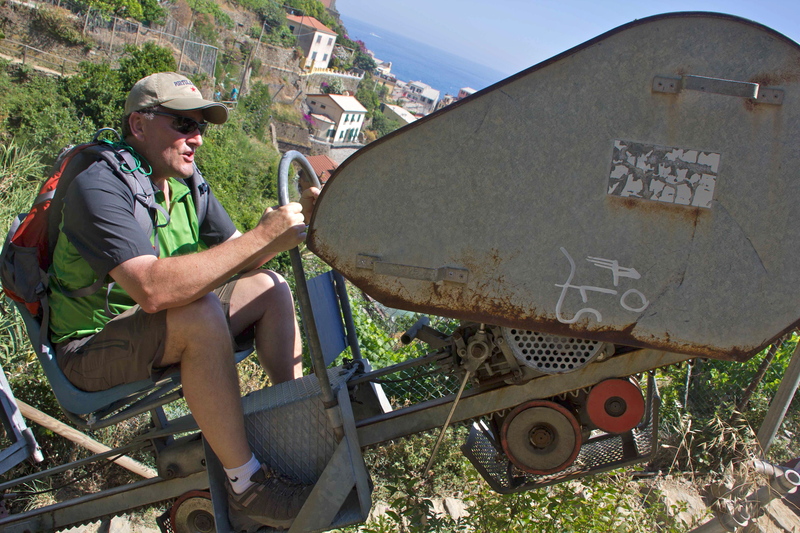 Brave driver, picking grapes and not afraid that the buggy might slip and fall into the sea! 5. 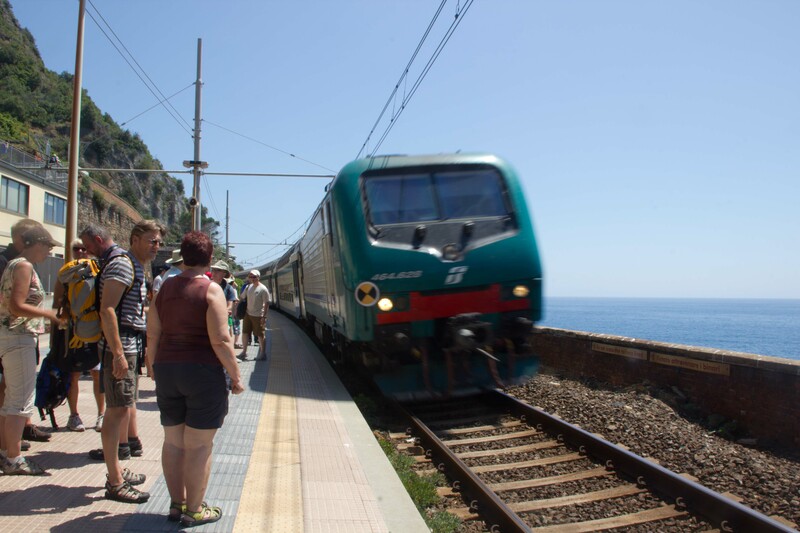 Finally, take the train back to Santa Margherita Ligure. We were tired, but satisfied from a full-day’s adventure and memories. 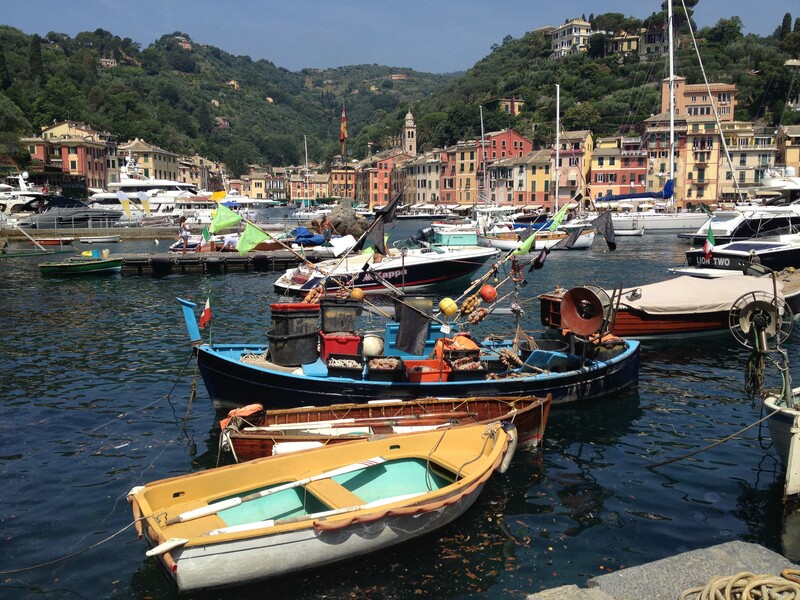 Portofino was just a pit stop for us on our hike fom Santa Margherita to San Fruttuoso Abbey. 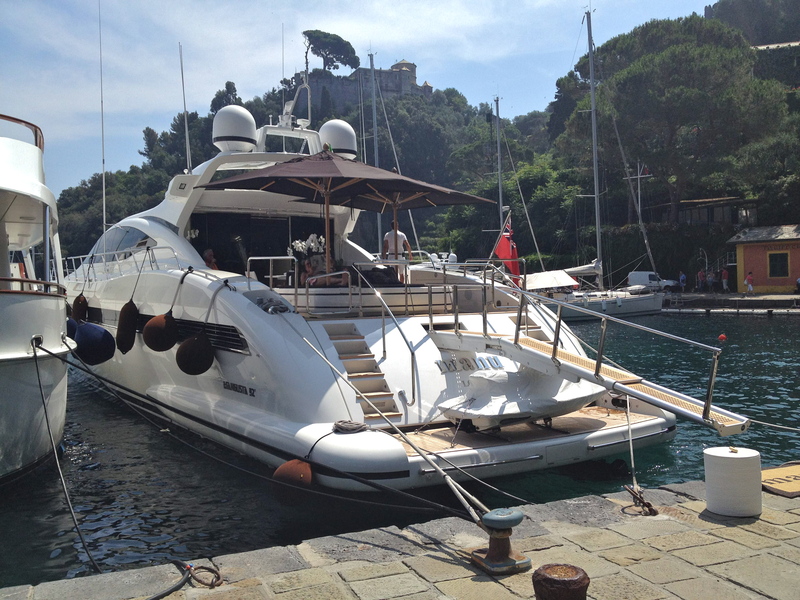 I can describe it in three words: small, crowded and yachts. Very picturesque, though, with colorful buildings fronting a very narrow harbor, and flanked by villa-studded hills. 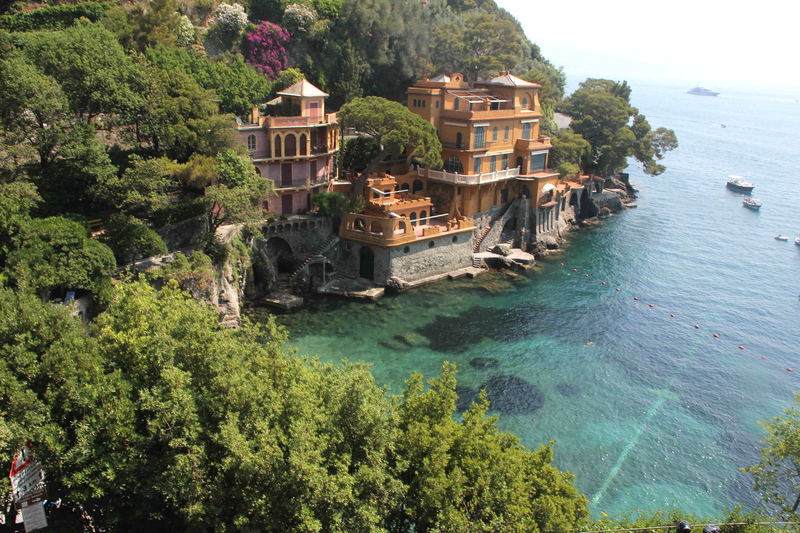 I suppose this view is what gives Portofino its charm. Our first order of business was to find a gelato shop to cool us from the heat. Licking our gelatos, we walked along the harbor gawking at the fancy yachts, peaking inside as if we would see anyone famous! One set of lounge chairs was done up in leopard print! We didn’t linger. After 30 minutes of soaking in the scene, we continued our trek to the abbey.